Connect with confidence using the SmartNode 4520 VoIP Gateway Router. Integrating a complete enterprise router with a full-featured Voice-over-IP Media Gateway offers the new standard in toll-bypass, remote/branch office connectivity, and enhanced carrier services. Perfect for the Remote office, Branch office, or PBX/Switch extension, the SmartNode 4520 integrates all your voice, FAX, and LAN traffic for seamless and secure networking. With its FXS analog ports the SN4520 Series supports up to eight simultaneous calls, connects to any legacy telephone or PBX, and provides dial-tone, ringing, and caller-ID. When equipped with FXO ports, the local PSTN can be accessed enabling local calling, enhanced toll-bypass services, and fallback configurations. ClearConnect™ adaptive network monitoring ensures your call always gets connected even if the VoIP link goes down or becomes congested. With dual 10/100 Ethernet ports, the SN4520 Series provides IP routing with guaranteed Quality of Service. Voice traffic is prioritized while LAN/IP traffic shaping permits efficient access to the Internet and corporate networks. 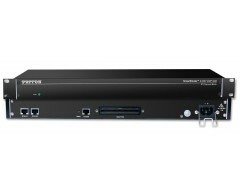 As a complete enterprise router, the SN4520 supports DHCP, NAT, Firewall/ACL, and PPPoE clients. While IPSEC VPN and VLAN tunnel data while DES, 3DES or AES enables secure voice and data over the public network.